This paper examines two influential slave uprisings and the treatment these received by both the abolitionist movement and the press. The first section explores the country’s reaction to John Brown’s raid on Harper’s Ferry, as well as his subsequent trial, conviction, and execution. The second section discusses the media coverage of and reaction to the Southampton Insurrection, the largest slave rebellion in the history of the United States. The third section explores the contrasting reactions to Nat Turner’s and John Brown’s respective revolts, and analyzes some of the reasons why these events received such differing responses. Ultimately, the paper explores a variety of potential reasons for the differing reactions to these two pivotal events, and the possible consequences of the actions, and inactions, of the abolitionist movement and the press. Throughout the better part of the past year, I have endeavored to understand the differing, and ultimately converging, lives of two men--- Nat Turner and John Brown. I have lived with them, breathed their words and writing, in the hopes of arriving at the larger truth that lies within their eventual sacrifice. Although they were men who came from vastly different backgrounds, they somehow managed to arrive at the same conclusion: that slavery was an evil that had to be eradicated, and that their lives were a small enough price to pay for its defeat. I have also strived to understand the reaction of a nation which found itself utterly divided during this time period, and the ways in which Nat Turner’s and John Brown’s seminal events--- the Southampton Insurrection and the raid on Harper’s Ferry, respectively--- caused, or hastened, the dark clouds of Civil War which loomed large in the horizon. What I found is a world of newspapermen and abolitionists who were no less divided and conflicted than dictated by the zeitgeist in which they developed. I found a Southern press which struggled to comprehend Nat Turner’s ruinous attack, an abolitionist movement that was reluctant of putting its full weight behind a black man, and a Northern press that failed to capitalize on a golden opportunity to bring about change in the South. I found a great man--- John Hampden Pleasants--- who stood head and shoulders above the rest of his Southern brethren, reporting honestly and truthfully, not only the vicious acts of Nat Turner and his men, but also the equally brutal consequences of Southern vigilante actions which saw hundreds of Blacks summarily executed in the aftermath of the Southampton Insurrection. I found a glimmer of hope, winds of change in Virginia--- where thousands of men and women of all walks of life joined together in short-lived abolitionist sentiment. In William Lloyd Garrison, I discovered the great conflict of a gifted mind, still prisoner to a baseline of racism which deafened him to the faint whispers of change that echoed in the aftermath of Nat Turner’s rebellion. Later still, I saw an abolitionist movement that acted far too late--- in the aftermath of John Brown’s execution, when it did with him what it should have done with Nat Turner yet did not; a failure which may have indirectly caused the deaths of more than half a million people. 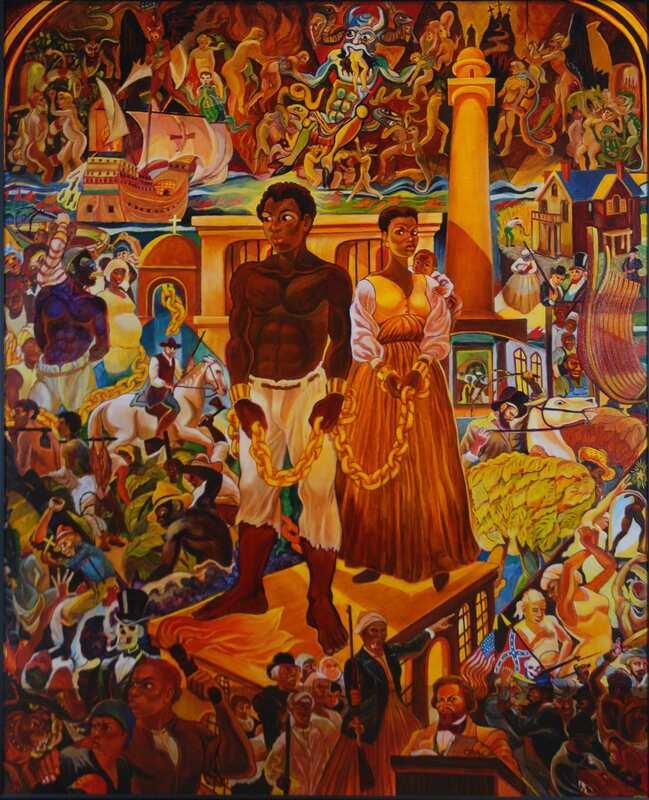 A colorful and gripping scene evoking scenes from America's dark history of slavery is depicted in "Baltimore, My Baltimore," painting by Arvie Smith (2006). The first section, “Sic Semper Tyrannis,” explores the country’s reaction to John Brown’s raid on Harper’s Ferry, as well as his subsequent trial and execution. It deals with his supporters, who first deserted him and then rallied around him, championing his induction into the American pantheon. The second section, “A Horrible Ferocity,” discusses the media’s coverage of and reaction to the Southampton Insurrection, the largest slave rebellion in the history of the United States. It deals with John Hampden Pleasants’ work, a precursor to modern-day investigative journalism, and the many responses to his work which populated the columns of Northern newspapers, at a time when the North and South were not yet headed for certain war. The third section, “Humanity Will Out,” explores the contrasting reactions to Nat Turner’s and John Brown’s respective revolts, and strives to analyze the reasons why these events received such differing responses. It also examines the grassroots abolitionist movement which took hold of Virginia’s citizenry in the aftermath of the Southampton Insurrection, and the failure of the Northern abolitionist movement to support it, as well as the possible consequences of this inaction. The most famous image to emerge from Europe in the wake of the Harper’s Ferry raid was an engraving, titled simply John Brown.1 In it, the landscape is dark, the scene enveloped in shadows, and a human figure hangs from the gallows. Its features are almost completely obscured, blending masterfully with the cataclysmic scenery. From the heavens, a lone ray of light threatens to wash over the concealed figure, stopping just short of illuminating the figure’s face. Just above the scene, floating ethereally, a Latin inscription: Pro Christo Sicut Christus--- For Christ, Like Christ. On the same day Hugo was penning his letter; at a eulogy delivered in Cleveland, Ohio, Charles H. Langston, a prominent abolitionist who would become the first black man elected to the United States congress, declared the following: “I never thought that I should ever join in doing honor to or mourning any American white man.”6 Langston’s sentiment was shared by most throughout the African-American community. Many black-owned businesses across the North closed their doors in mourning on December 2nd, 1859, the day Brown was hanged. Thousands of people, white and black, gathered throughout the region to express their sorrow. The negative initial reactions of abolitionist Northerners quickly faded, and Brown’s financial backers gradually came out of hiding--- Gerrit Smith would discharge himself from the asylum he had voluntarily entered after a stay of about two months. Leaders within the anti-slavery community quickly realized that John Brown had the potential to be turned into the most remarkable martyr to their cause since Elijah P. Lovejoy’s brutal murder at the hands of a deranged mob twenty-two years earlier. For someone whose life had been greatly marked by personal failure, this promise of immortality was perhaps very tempting.20 As a matter of fact, there is quite possibly no greater blunder throughout this entire process--- on either side of the Mason-Dixon line--- than Virginia Governor Henry Wise’s decision to allow Brown to have visitors, as well as send and receive correspondence while in jail. This simple act of mercy allowed Brown to transform the world into a podium from which to justify his crusade to the nation: throughout the six weeks that Brown spent in jail, he was visited by as many as eight-hundred people, and wrote hundreds of letters.21 He was privy to virtually every piece of news, writing and rhetoric that the North was producing. The way in which Brown had come to see himself was made even more obvious in some of the letters he wrote from jail. In a letter to “E.B.,” Brown says: “You know that Christ once armed Peter. So also in my case I think he put a sword into my hand.”25 Truthfully, the extent to which Brown was influenced by the foresight of his supporters cannot be measured empirically. However, it would be naïve to argue that the abolitionist community’s actions did not directly inform Brown’s performance--- for there is no better term for it--- throughout the final weeks of his life.